Paris is bursting with love. As soon as she looks at you, she becomes utterly devoted and can’t wait to get close to shower you in kisses! She is great at walking on a leash, friendly with cats and she gets along very well with other dogs. She is very sweet with children and full of kisses for them too. Because of her small (and delicate) size, we would like to see her placed in a home with children who are old enough to understand how to safely show dogs affection. If you are interested in Paris please visit www.dibsrescue.com to apply. 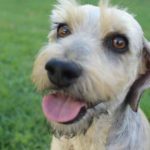 Families with children who are interested in adopting Paris should be sure to review the information on kids and dogs in the “About Dogs” section of our website before applying (www.dibsrescue.com/aboutdogs).